There are plenty of tutorials on this Photoshop technique and I highly recommend checking them out on Youtube. Since I just wrapped up the editing on a photoshoot where this was the primary tool I used to work on the images, I wanted to spend this post appreciating and promoting this non-destructive technique. 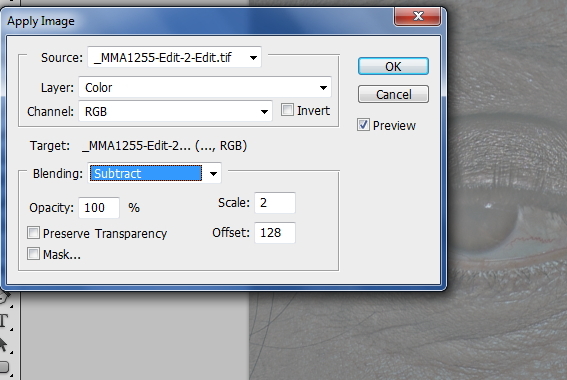 It really has two functions: to adjust color and to edit surface aberrations. The "separation" that occurs is between these two elements of the image. Where it became useful, was in lightening the dark circles under the eyes (which everyone has to some degree by virtue of lighting from above), and the skin texture which we want to largely preserve. 1. The issue I'd like to address here is the slightly darker coloration under the eye. The coloration is slight, but this is a beauty-related image. 2. 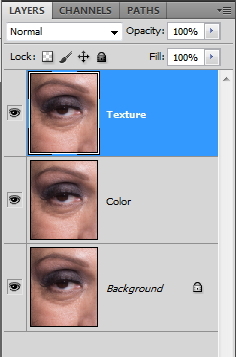 Duplicate the original layer twice and name the middle layer "color" and the top layer "texture." 3. Select the middle layer and apply a Gaussian filter (Filter - Blur - Gaussian). Set the radius between 10 and 15. You want to it to be blurry enough to remove texture, but still retain color separation. You want to make sure the Layer is set to "Color." The next part depends on whether your image is in 8 bit or 16 bit. You can check which bit mode you are in by going to Image - Mode. If in 8 bit (the example above) you must sent Blending to "Subtract," Scale to "2" and Offset to "128." 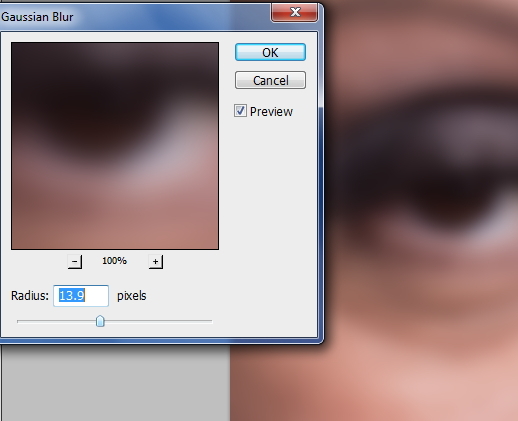 If the image is in 16 bit, Blending is "Add," Scale= "2," and "Offset = "0." These are not interchangeable. 5. The image is now all grey. Set the Blend mode for the top layer to "Linear Light." The image should look exactly like it did before we started. 6. Select your Clone Stamp tool, click on the middle Color layer. Sample from the area you prefer and paint on the area you want to change. I prefer to use a low flow of about 5%, and gradually paint up the area. For reasons I can't explain, I've found that YOU MUST HAVE THE TOP LAYER VISIBLE WHILE WORKING ON THE MIDDLE LAYER. The difference here is slight, but it can be dramatic depending upon your original. Now you have corrected the color differences but kept the texture of the skin. 7. Click on the top Texture Layer. Using your Clone Stamp tool again, sample the area you want to clone and paint over the "problem" area. I typically set my Flow to around 20% for this process. A word of caution, though: wrinkles and texture around the eye are natural and make it appear real, not plastic. I often leave the wrinkles as they are, or use the Bonus step below. 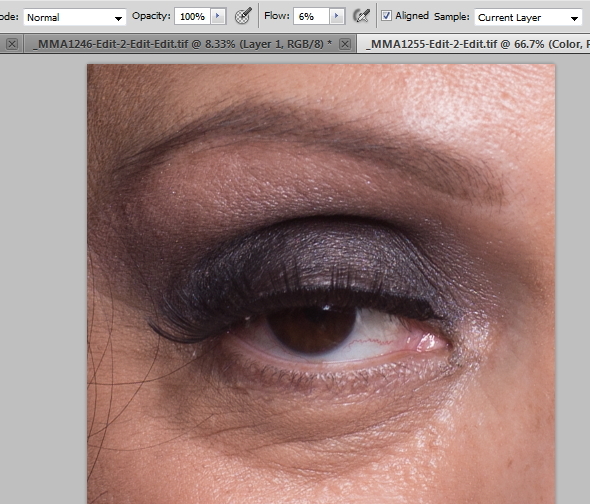 Here is the image with the wrinkles "softened" but not turned into the skin texture of the cheek. Bonus Step: The bonus step is something you would do before all of the others. I like to preserve the wrinkles around the eye, but sometimes they are just too dark. Instead of using the clone tool in step 7, I'll start by carefully Dodging the lines. I find it works best to do this at the beginning; the subsequent steps (and if you choose to lightly clone under the eye) will blend the dodge-work better.